At the Palestine Hotel in Baghdad, they used to wash the floors with gasoline, because in Iraq it came cheaper than water. Similarly, the nice man in the video, in Saudi Arabia of all places, likes to drink motor oil. He says it is a “natural energizer,” good as food, which may be true if you are a motor, but is an unusual perspective for a man. Apparently considerations of consumer cost don’t enter into the substitution for him, unlike the Mesopotamian hotel staff. But that may change. The world is in the middle of an ongoing food crisis. 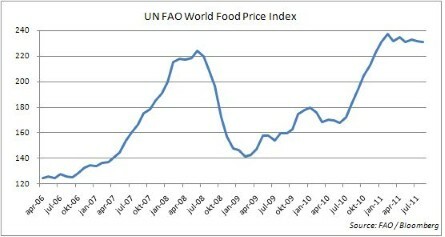 In 2007-2008, food prices rose massively, fuelling protest and unrest from Bangladesh to Burkina Faso. Prices fell again sharply as the 2008 economic collapse struck, but soared again late last year, reaching a peak in February slightly higher than before. The difference is that by this year food stockpiles had been prudently built up, giving countries a cushion against the impact. World population, and hence food demand, is burgeoning (welcome, Baby 7 Billion!) — but that’s not the sole or maybe even major problem. In recent years, growth in food production has slightly exceeded population growth. Two reports launched last month pointed to other causes. The 2011 Global Hunger Index (or GHI, an annual project of the International Food Policy Research Institute, Welthungerhilfe, and Concern Worldwide) rates the level of hunger in countries by three indicators: the proportion of undernourished people, the proportion of children under five who are underweight, and child mortality figures. 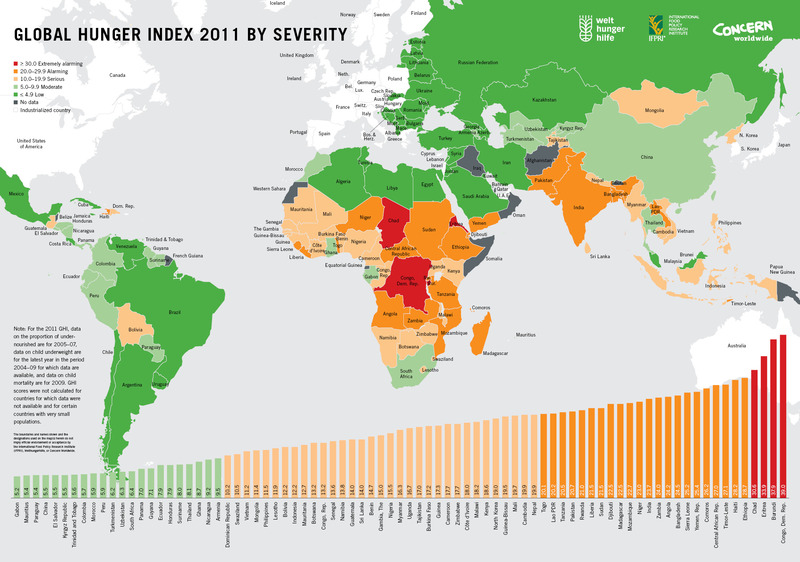 It showed 26 countries confronting grave hunger crises, with prices powering deprivation. The document named two culprits. One, the growing expropriation of food supplies to make biofuels (up to one-twentieth of global food production is being diverted, by some accounts) is fairly well-known. Less widely advertised, though, is the role of growing commodities futures speculation in global food markets. A UN report on “The State of Food Insecurity in the World 2011” largely agreed with this diagnosis. You thought food was meant to be eaten, oil and gas to be turned into energy, and metals to be turned into cars, bridges and downspouts. You weren’t sophisticated enough to realize that these really are just different “asset classes” meant to give investors around the world something to speculate in and to diversify their portfolios. Even worse, you actually believed all that stuff about prices being set based on market fundamentals. Little did you know that it’s no longer the supply and demand for companies, houses, office buildings, natural gas or wheat that sets prices. More likely it’s the supply and demand for the futures, swaps and other derivative instruments linked to those things. The strong demand for commodities futures [puts] upward pressure on the actual prices paid for those commodities by real producers and consumers, if for no other reason than many private sales contracts are settled at a price linked directly or indirectly to futures prices. 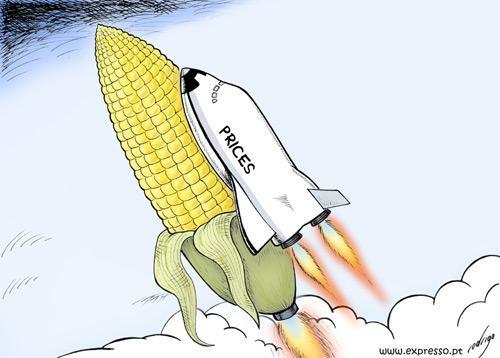 In other words, speculators’ demand for nonexistent future corn drives up the price of the real corn hungry people want today. Pearlstein worries that commodities are an investment bubble that will explode in time, as the housing market did, to disastrous effect. The more immediate cause of concern is that as stockpiles run low, people starve. The credit collapse did nothing to disrupt the hallucinatory speculative energies of capitalism, which mortgage the future to keep the present going, and make the present into a fiction in the process. We live in a reality tottering on the edge of evanescence, in an economy on financial LSD. But humans cannot live by hallucinogens alone. Meanwhile, in Egypt, the Muslim Brotherhood — dreaded by well-fed liberals and secularists — is campaigning for parliamentary elections in a couple of weeks in the most concrete way possible: by selling discounted food. This entry was posted in Economic Justice, Human Rights, Politics, Uncategorized and tagged biofuels, commodities, financial crisis, food crisis, food prices, Global Hunger Index, hunger, Occupy Wall Street, speculation by scottlong1980. Bookmark the permalink.